The Singapore Slingers hadn't played in a long while, but were ready for their first game in the Merlion Cup 2017 against the Yulon Luxgen Dinos from Chinese-Taipei. It didn't look like the usual Singapore Slingers that fans had gotten used to see play in the OCBC Arena over the past two seasons. The regular faces like Xavier Alexander (198-G-88, college: S.Nazarene), Wong Wei Long, and Ng Hanbin (193-G/F-89) were there but it just felt a little off without having Justin Howard (209-C-81, college: Mercer) anchoring the play inside. The Slingers struggled at the beginning against the Yulon Luxgen Dinos, looking a bit rusty and in search of reconfiguring their style of play. Botched passes and turnovers from miscommunication got the Slingers into a 14-8 hole, traillng to the visiting Dinos. Maybe all the Slingers needed was some time to get things going the right direction. A three-point shot by Wong Wei Long at the 2 minute mark sparked a furious 13-0 run by the home team. The Slingers ended the quarter in the lead 21-14 with a leaning fadeaway Leon Kwek jumper with the clock running down. The Slingers continued to pile on in the second quarter and pushed the lead to as much as 18 points. During their second quarter run, new import Ryan Wright (206-C/F-87, college: Oklahoma) finally got into the groove of the game and lit the OCBC crowd with a putback jam. 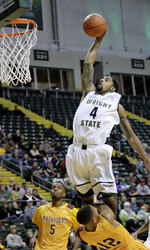 'I knew I was going to be a little sloppy at first,' Wright said after the game which he had 23 points and 10 rebounds. 'I was a little bit nervous but I knew that my team mates were going to play hard and if I played hard as well I was confident that we were going to have a good result.' It was a hot shooting quarter for the Slingers and the Dinos struggled to get their own offense going as well. The home team missed only 4 of their 15 attempts in the second interval and by the time the halftime buzzer sounded, the Slingers had already built up a 43-28 lead going into the locker room. The Slingers cooled down in the second half, but maintained the lead the rest of the way and even had chances to rest Alexander and Wright as well. Another new face to the team, Mikee Reyes, blended in well with the team for his first game. His numbers might not pop out, but he distributed the offense well and was a willing passer for most of the part. As new additions, Reyes and Wright were able to add another dimension as to how the Slingers played. 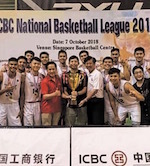 'I like that we pushed the ball and ran the floor,' Coach Neo Beng Siang said. 'We can improve on team defense because the structure is still not there.' The game progressed on until the final buzzer with the Singapore Slingers winning 89-69 in their Merlion Cup debut. Xavier Alexander hadn't missed a beat from last season and flirted with a triple-double of 18 points, 9 rebounds, and 9 assists. The Slingers had five players scoring in double digits, with Leon Kwek, Russel Low (195-C-93), and Delvin Goh in addition to the two World Imports. 'It was a good game,' Low said. 'It was the first game of the preseason. I think we did well but definitely there are a few things we can fix up.' The Slingers will have a one day break before playing the Adelaide 36ers on Friday at 6:30 PM.